What is it about Western New Yorkers that sets us apart from everyone else? Is it our iron will? Our inner resolve? Our unbending spirit? Our ability to always see the glass as half-full? The answer is an emphatic "yes" to all of the above. On a cold morning in 2002, a third grade girl released a purple helium balloon in the sky over Ogden, Utah. Amazingly, a man who was walking his dog found the balloon just three days later -- in Niagara Falls, New York! The question of why, and not how, the balloon made it nearly 2,000 miles led this man to an epiphany. Local writer Frank Thomas Croisdale realized that the balloon symbolized the best qualities of all Western New Yorkers. It was resilient, determined and driven by fate. 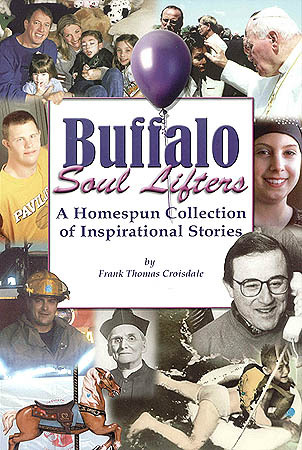 The result is a unique book called Buffalo Soul Lifters: A Homespun Collection of Inspirational Stories. The meticulously researched 144-page book showcases people in our community who have achieved stunning accomplishments by believing in themselves and in others. From Hunter Kelly and Father Baker, to the young boy who survived a plunge over Niagara Falls, and the Amherst plastic surgeon who treks to impoverished countries to help disfigured kids, all the folks in this book share a common trait. In their unique ways, they are all purple balloons sent to remind us that hope is our lifeblood. Buffalo Soul Lifters contains 33 chapters, each highlighting a fascinating tale of local inspiration, bravery or determination. Each story will touch your heart and raise your spirits.